We're continuing to add all sorts of amazing animal-themed products to the ZooHood shop. The latest additions include some seriously lovely products - a range of notebooks made by our friends at Ohh Deer. See above for some images, or visit the notebooks page of our shop website. 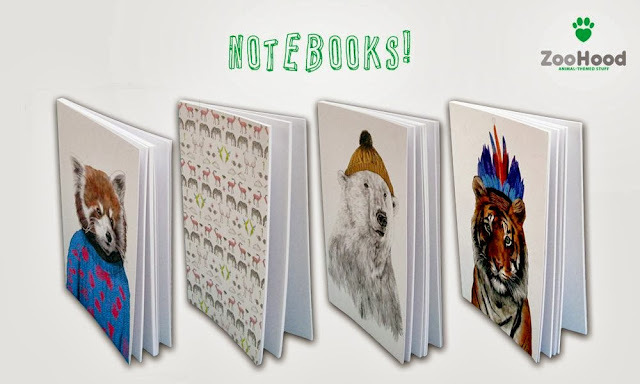 Each one of these Ohh Deer animal-themed notebooks is an A4 sized book with eighty blank white pages. They're really well made, with a 350gsm card cover that features an illustration on the front cover. The illustrations are all animal themed (as you might expect from us), well printed and strikingly cute. There are 4 options to choose from: a red panda with a woolly jumper, a collage of lots of different animals, a polar bear in a bobble hat and a tiger in a headdress. They join the existing notebooks which we already had in our store - which include notebooks featuring hares, owls, foxes and otters. Notebooks make great gifts. Everybody loves stationery, and you can never have enough of it. As lots of you will be going back to school/university/college at the moment, we're expecting to sell a lot of these beauties in the coming weeks as well as in the run up to Christmas. So come get 'em people! Check them out, along with other fab stationery products, on our animal stationery page.